Please bring valid photo ID! As always The Doctor’s Orders is all about party! Tonight we go all out with a Hip-Hop vs R&B special. Kiss FM’s, MOBO award winning DJ Shortee Blitz is as adept at tearing up a dance-floor with such soul drenched sounds as he is Hip-Hop. He will be tearing through everything from 90’s Teddy Riley produced classics to Beyonce bangers while resident Mr Thing keeps to his well loved Hip-Hop bangers as they go back to back for three hours in our Hip-Hop vs R&B special. Keeping the theme alive Spin Doctor & guest DJ LoK will also be showing off their smoother sides with special R&B sets while Chris P Cuts does what he does best spinning selections of Hip-Hop from classic boom bap to brand new trill making sure that all heads are left nodding and asses left shaking! With the best loved and most respected DJ in the UK’s Hip-Hop throwing a birthday party you know this is going to be a complete road block with a wealth of people not only clambering to get into the party but also offering their talents on the decks and Mic. Mr Thing has done it all from win battles, DJ clubs and festivals around the world, release mixtapes and compilations to producing for many of the countries finest MC’s and all with the relaxed charm of a man that loves his work. Very few people in the music game hold the privileged position of not having anyone with a bad word to say about them, in fact it is a spot Mr Thing probably holds on his own. 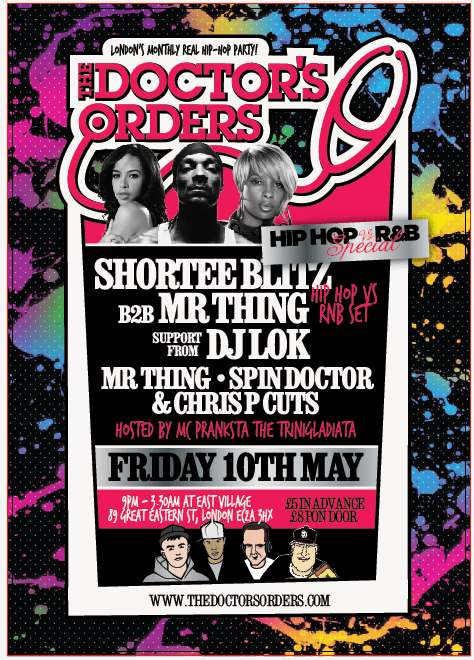 To celebrate The Doctor’s Orders have a dream line up of many of London’s hottest DJs, Producers and artists will be keeping this brilliant Shoreditch venue bumping from wall to wall all night. You can expect a party packed mix of Hip-Hop, Soul, and way more besides as we celebrate this big occasion in style. We think the line up speaks for itself so just be there to hear them do their thing! Live and direct for another month we have two of the UK’s finest emcees on stage… no question! > First up is Terra Firma’s SKRIBLAH DANGOGH gearing up for his debut solo album release ‘The Little White Dot’, performing an exclusive showcase of tracks from the album especially for the SP Live crowd, the first time Skribz will have performed any of these new bangers on stage. Be sure to reach!! These two are expert mic fiends, you WILL be rocked! All taking place on Friday 12th August @ Vibe Live (upstairs @ Vibe Bar), Brick Lane, London, E1. Kicking off at 8pm, and ending at 1am. It’s free entry if you reach the downstairs bar at Vibe before 8pm, and £4 thereafter. > Also, downstairs for extra flavour, former DMC Champ Mr Thing & fellow DJ and vinyl enthusiast JP join forces for their Monthly throwdown of all things good from their extensive record collections – ‘Thing Fridays’. Expect everything from your favourite anthems to the super rare gems they have unearthed over the years – Hip Hop, Funk, Soul and everything inbetween! [London] SET IT OFF with Disorda & DJ LoK – Friday 26th November @ The Star of Bethnal Green – FREE ENTRY! Disorda & DJ LoK will be supplying a heathly mixture of Soul, Funk, Disco, Hip Hop, Reggae, Party Classics and everything inbetween. Come an’ let loose, the last Set It Off, went off!!! Saturday 23rd October sees the Dogstar in Brixton get turned over by some of Londons finest DJ’s & Musicians as Hip Hop promoters Main Squeeze and charity event specialists Oxjam Brixton Takeover come together to showcase a night of Hip Hop and Reggae. For one evening we will be taking over the whole of The Dogstar in Brixton. Music will be spread over 2 floors and wristband will be on sale for entry to both floors. All the deejays and artists have agreed to play for free in aid of raising as much money as possible for oxfam so grab a wristband and come party hard. Tickets £8 available from wegottickets.com. Few tunes have been heard as regularly at The Doctor’s Orders events over the past 5+ years as those recorded by the greatest Hip-Hop group of all time A Tribe Called Quest, so we are ecstatic to have one of their three members in the shape of Ali Shaheed Muhammad join us for an Exclusive DJ set at On The Real. Queens Natives A Tribe Called Quest reshaped the Hip-Hop scene with the release of their five classic albums that all pushed the soulful, jazz drenched sounds that became not only thier trademark but that of Golden Era Hip-Hop on the whole. With a catalogue of stone wall classics such as ‘Can I Kick It’, ‘Award Tour’, ‘Electric Relaxation’ ‘Scenario’, ‘Bonita Applebum” and the Dilla produced ‘Stressed Out’ the Tribe sound is as popular today as ever. Having recently reformed to tour and with a documentary on the band due to be released shortly A Tribe Called Quest are now back on top of the game where they belong. Away from Tibe Ali was a founding member of the production outfit The Ummah, alongside Q-Tip and J-Dilla, producing great tracks not only for Tribe but Busta Rhymes, D’Angelo and Janet Jackson to name a few. He then went on to show an even more soulful side of his work in founding Lucy Pearl alongside Raphael Sadeeq and Dawn Robinson. With this wealth of musical experience behind him this exclusive DJ set it sure to take a guaranteed packed house through a great journey of Hip-Hop, R&B, Soul and beyond. As ever these visiting guests are welcomed by one of the strongest resident line ups in the land as London’s finest DJ 279 and Spin Doctor set the mood with their brilliant party blend of classic and brand new bangers. Holding down duties on the mic are our host MC Prankster the Trini Gladiata who will be keeping the crowd involved with his classic crowd hyping style while the brilliant Skillit joins us for a live PA.